After my visit to the oldest house and school in Florida, I stopped by the Castillo San Marcos National Monument. This fort, built by the Spanish, was never defeated in war, but changed hands by treaty. 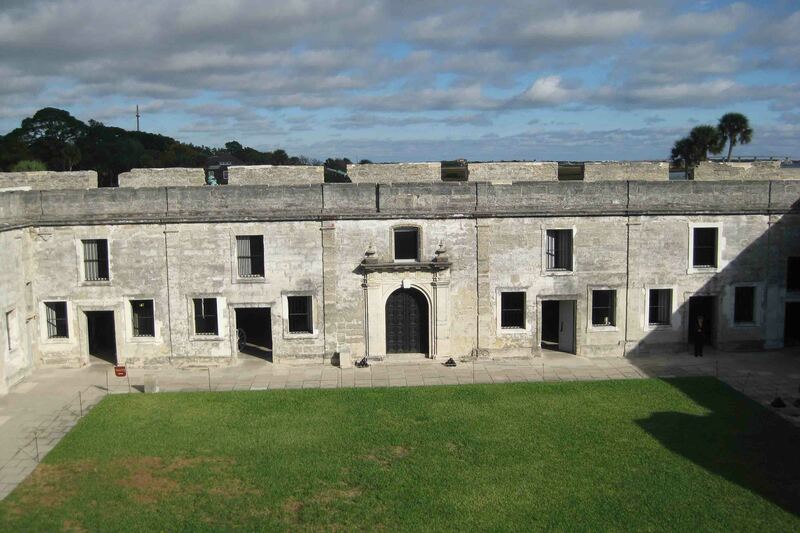 The fort built of coquina walls, begun in 1672 and completed in 1695, replaced wooden structures used to protect St. Augustine against the French in 1565. In 1702 and again in 1740, the fort successfully survived a siege by the British. As a result of the Seven Years’ War, in 1763 Spain ceded Florida to Great Britain in exchange for La Habana, Cuba. At such time, British troops occupied the fort and did so through the American Revolution. The Treaty of Paris of 1783 returned Florida to Spain until 1821 when Spain ceded Florida to the United States. The Americans used the fort to house Indian prisoners during the Seminole War of 1835-1842. Later it was occupied by Confederate troops during the Civil War. Its final use was a military prison in the Spanish-American War. The Spanish built the fort with a chapel, vaults, guard rooms, bastions, a well and a moat. The Spanish soldiers lived in town with their families, so they came to the fort to stand a rotating guard duty. Because religion was an important part of Spanish daily life, a priest conducted mass for the soldiers at the chapel. The moat was generally kept dry and served as a pen for animals during sieges. The moat was filled with water if the fort was under land attack. When the British occupied the fort, the vaults were converted to living quarters for the soldiers. In order to make enough room for the men, wooden second floors were added to the vaults and bunk beds slept four, two men in the lower bunk and two men in the upper bunk. In 1842, the U.S. Army filled in the east side of the moat and mounted artillery pieces along the coast including a shot furnace. The furnace heated cannonballs red hot so when fired at enemy’s wooden ships, the ships would catch fire. After touring the fort, I continued south to Wellington, Florida, but not before stopping in Orlando to have a lunch with a friend, Glen, at Dexter’s. We had a nice visit at a local hot spot and he escaped without a picture, so the front of Dexter’s will have to do.